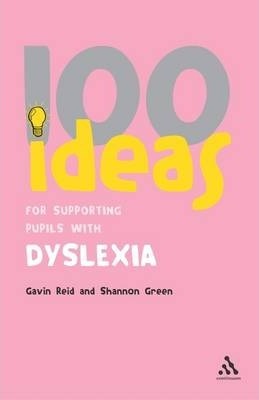 One in a series of guides for teachers, this text presents 100 ideas for supporting pupils with dyslexia. 1. Planning for Learning; - different strategies; - classroom organization; - individual children's needs; 2. Identifying needs; - observation; - assessment; - coping with challenges; - ensuring success at tasks; 3. Reading; - irregular words; - vowel sounds; - letter sounds; - reading in context; - importance of language experience; 4. Reading comprehension; - use of inferences; - knowledge of concepts and schema; - vocabulary and language understanding; 5. Spelling; - strategies rules; - spelling in context; - visual shapes of words; - bottom up and bottom down strategies for both the visual and the analytical learner; 6. Creative writing; - developing creative writing skills; 7. Number work/Maths. - strategise for remembering times tables and number bonds; - time and dates; - mathematical concepts e.g. angles, fractions; 8. Memory; - memory strategies which are meaningful and fun; - passing exams; - revision; - note taking; - organization; 9. Discussion; - understanding and developing concepts through discussion; - developing discussion techniques; 10. Developing self-esteem; - peer acceptance; - group work; 11. Learning Styles; - identifying different learning styles; - cognitive; - environmental factors; - planning learning; - classroom organisation; 12. Self-advocacy; - helping children understand dyslexia. A teacher for many years, Dr Gavin Reid is now Senior Lecturer in Educational Studies at the Moray House School of Education, University of Edinburgh.